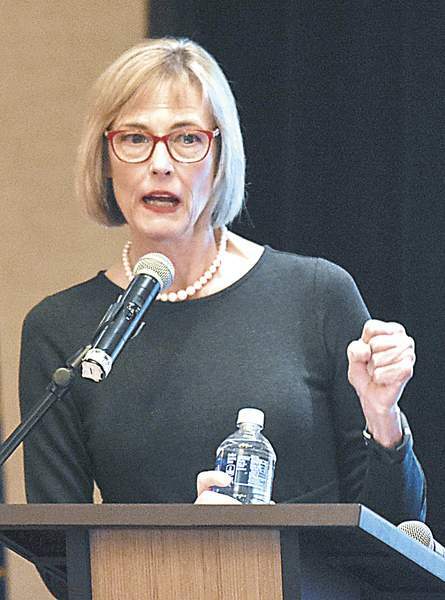 Suzanne Crouch is Indiana lieutenant governor. As a 12-year-old who towered over her peers and teachers, I was a target for many of my classmates' jokes and ridicule. My father gave me some advice that helped shape who I am today. His valuable lesson was to love, accept and respect myself. When I began to do that, even with my imperfections, I could accept and respect differences in others. While my childhood experiences in no way compare to the daunting task Hoosiers with intellectual and developmental disabilities face every day, it serves as a reminder of just how much being isolated, different or left out one can feel. It's why I am so focused every day on lifting up those working through challenges. All Hoosiers deserve the same opportunities. There are about 100,000 Hoosiers who have an intellectual or developmental disability. Indiana is taking steps in the right direction, but there is more we can be doing to help. In 2017, nearly 30,000 Hoosiers with intellectual and developmental disabilities were able to receive services and support in a variety of locations, including their family's home, their own home, a group home, on the job and in our communities. Advocates with intellectual and developmental disabilities, their families and partner organizations, as well as local community-based rehabilitation agencies, national service providers, and local and state government agencies, are joining to create a community-based support system for individuals with disabilities and their families. Because of the limited housing opportunities for people with intellectual and developmental disabilities, most continue to live with their families. In many cases, adult children remain at home until parents either can no longer care for them or pass away. Younger parents often juggle two jobs while managing the daily, complex needs of a child with intellectual and developmental disabilities. More effective family and caregiver training is key to ensuring Indiana maintains the commitment to community-based support for individuals with intellectual and/or developmental disabilities. This training should be available to families and parents throughout their loved one's life. Providers face a severe shortage of direct support workers. Within this challenge, there is the opportunity for Indiana to invest in developing a well-trained, high-quality workforce that has the most up-to-date technology and innovations to support individuals with intellectual and developmental disabilities in a way no other state has yet to achieve. Collaborative work from the General Assembly has given us the opportunity to affect the lives of those with intellectual and/or developmental disabilities through House Enrolled Act 1102. This law provides the framework for a comprehensive rethinking of how Indiana provides support to Hoosiers with intellectual and developmental disabilities. As a passionate supporter of the disability community for many years, I am honored to chair the task force. I am honored to be serving alongside the other 17 members, working to create a comprehensive plan that will promote and support Hoosiers with intellectual and/or developmental disabilities. Every success we help someone achieve opens their life to great opportunities for independence, self-worth and employment. Our friends with disabilities are really just friends with different abilities, and they have the same dreams of every other Hoosier and American – to have friends, to have a job, to love and be loved, and to be successful. I am grateful for every dedicated Hoosier working tirelessly to ensure that individuals with different abilities are successful and supported. Thank you for the honor of continuing to serve you as we take Indiana to the Next Level for all Hoosiers.